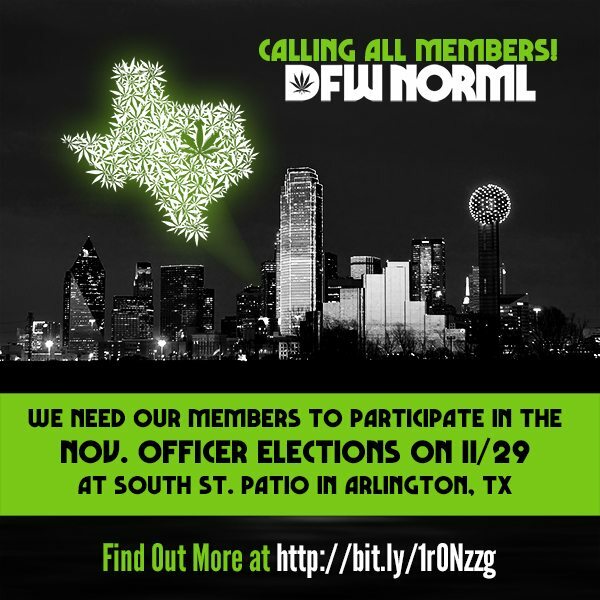 Calling all DFW NORML members! On Saturday November 29th our organization is holding our November Meeting and Officer Re-Elections and we need ALL OF OUR MEMBERS to cast their vote. Why? Because we attempted to hold our officer elections last month and failed to meet quorum, which means we did not have enough active members vote in order for the vote to be be legally valid per our new chapter bylaws we adopted back in 2013 which states that we must have 30% of our active members to achieve quorum. The actual re-election will begin today through online voting and conclude on 11/29 with in person voting at our November meeting which is being held at the South Street Patio (400 E South Street, Arlington, TX) from 4pm – 6pm. This meeting is FREE TO ATTEND and OPEN TO THE PUBLIC, meaning you do NOT have to be a paid member of DFW NORML to attend. In addition to the re-election process, we will have a variety of speakers discussing cannabis, the need to reform our outdated laws, opportunities to get involved and more! Only two of the three positions up for re-election this year have more than one candidate. The positions and their candidates are listed below. Some of these candidates chose to provide candidate profiles about themselves to the Texas Cannabis Report, which we will include as a link next to their name. Please note that new members must have registered for their membership BEFORE November 29 in order for their vote to be valid. An online voting link will be sent to members at the email address they used when they signed up to become a member. If you’re not sure whether or not we have your email address, feel free to signup for our e-newsletter just make sure we get an online ballot to you because we need your participation – and we promise to NEVER send you spam or share your email address with anyone. Thank you for being NORML! Click the graphic below to RSVP to this event on Facebook so that you can stay up to date with the latest developments on this important event.